Eating foods that contain saponins, a group of chemicals found mainly in plants, may help you lower your risk for high cholesterol and cancer and help you control your blood sugar, according to an article published in the "Journal of Medicinal Food" in 2004. Many plant-based foods contain at least small amounts of these plant chemicals, but beans are among the best sources. 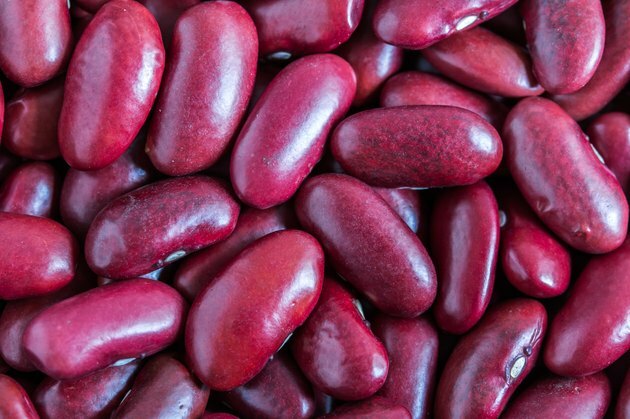 Soybeans, chickpeas, kidney beans, navy beans and haricot beans are among the richest sources of saponins. While cooking these foods won't reduce the saponin content, fermenting them does, so eating fermented soy products like tempeh won't increase your saponin intake as much as eating other types of soy products. Garlic contains saponins that act as antioxidants, according to an article published in the "British Journal of Nutrition" in April 2011. The saponins found in asparagus may also have health benefits, potentially causing the death of cancer cells, according to a study published in "Current Oncology" in July 2012. Alfalfa sprouts, peas and yucca also contain saponins. While grains don't typically contain high amounts of saponins, exceptions exist, such as oats, which have two different types of saponins. Two pseudo-grains -- quinoa and amaranth -- also contain these chemicals. In the case of quinoa, however, most of these saponins are removed during processing or washed off before cooking because otherwise the quinoa will taste bitter. Red wine can provide a significant amount of saponins, with the amount varying based on the type of wine, according to research conducted at the University of California, Davis, and presented at the 2003 meeting of the American Chemical Society. The saponins come from the coatings on the skins of the grapes used to make the wine. Red wines can have up to 10 times the saponins of white wines, with red Zinfandel wine having the highest amount of these chemicals. The alcohol content of the wines also appears to help increase your body's ability to absorb the saponins. Plants aren't the only sources of saponins. Some marine invertebrates also contain these substances. One such animal is the sea cucumber, which has varying amounts of saponin depending on the type, according to a study published in "Marine Drugs" in January 2010. These creatures can be eaten raw, such as in sushi, or cooked in various ways.